Eldamil is an Altmer adept in the Mythic Dawn cult, and was one of Mankar Camoran's chief lieutenants. He's found inside the Forbidden Grotto of Paradise, and will aid you in removing the Bands of the Chosen. He will also help you fight Mankar Camoran, if you so choose. 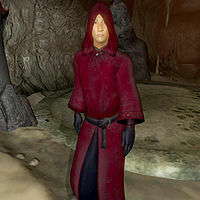 He wears a Mythic Dawn robe, a matching hood and a pair of braided leather sandals. Eldamil was one of the Chosen of the Mythic Dawn. He helped plan the Emperor's assassination. He was also the one that opened the Great Gate at Kvatch. While hunting down survivors after the battle, he was slain by three townsfolk who were hiding in a cellar. Thus, he was sent to Paradise. He has the magicka bonus conferred by The Mage birthsign, a bound dagger lesser power, as well as a leveled barrier spell and ranged shock spell. For weakness, remorse, and an obvious distaste for the supposed "Paradise", the Master banished him to the Forbidden Grotto to torture his former comrades who showed similar ingratitude for the gift of eternal life.